I’m sure most of us remember doing the long jump in high school and it’s probably not one of our better memories of our athleticism. 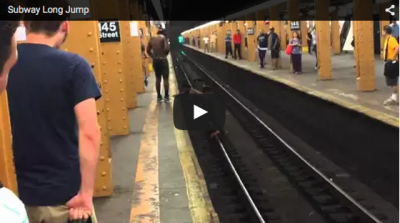 Well in this video making it’s rounds on the Internet, a man is attempting to long jump over train tracks in a New York subway station. Why this video is going viral isn’t because the guy made it, he actually fails pretty hard. The video itself was shared on YouTube by user Lei Gong and shows the man getting a running start, attempting to take a two-footed jump across the tracks. 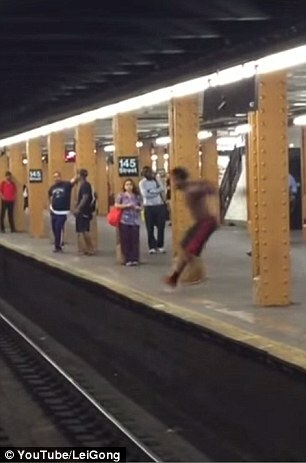 He doesn’t jump far enough and ends up slamming into the platform. The jumper appears to not be harmed, minus his pride, and quickly gets back up off the tracks. Check out the video below and share it with your friends.